Recreational fishing has a long history and is becoming more and more popular around the world. As a consequence, it has a growing socio-economic and ecological impact, which is suggested by several recent studies. For example, a recently published socio-economic study from Germany showed that recreational fisheries have a productivity effect of about 5.2 billion € in Germany, with approximately 52,000 jobs depending on the expenditure of anglers (Arlinghaus, 2004). The jobs generated by recreational fisheries have been found to be of equal magnitude to the whole commercial fishing sector in Germany. Important tourism and gear industries crucially depend on recreational fisheries. The overall benefit to the German economy was more than 6.2 billion € in 2002 (Arlinghaus, 2004). Similar impacts in other highly industrialised countries have also been reported in other studies, such as (Outdoorfoundation, 2007). In addition to its economic relevance, recreational fisheries systems also provide tremendous social benefits to society. Fishing for recreation is an activity that lies at the core of the life-style of millions of people in Europe and world-wide, and has social and cultural benefits, including psychological and health-related aspects. Regarding fishing as a common interest of millions of people worldwide, the relationships between these enthusiasts form various kinds of communities. Such communities may be organized as clubs or associations, or networks of loose and informal relations. The members of these communities interact in various ways. For instance, they arrange meetings, share information about their last angling trip with friends, or just inform themselves on weather or environmental information for their next trip. One such community, which represents an economically powerful sector within the tourism industry, is the sports fishing community. It is stated in the aforementioned study (Arlinghaus 2004), in which the author analysed different statistics, that there is no exact number of recreational fishers in Germany available, but that more than 3.4 million Germans go fishing from time to time.1 Normally, fishing trips are characterised by different subsequent phases: the planning phase, the event itself, and a recollection phase (Arlinghaus, 2002). In the recollection phase, fishers maintain their equipment, sort their taken pictures, and synchronise these pictures with location data tracks (in the case that they are using such technologies). Due to the fact that fishing is a location-dependent activity, and that fishers do have some need for communication and the sharing of information (such as hints, images, knowledge, etc.) among each other, mobile technologies could help to satisfy these needs. Therefore, the users’ demand for accordant mobile services increases shortly before the event, in order to coordinate with others or get and share information about the fishing location; and during the event, in order to stay connected and to immediately access location related information (e.g. weather conditions). The aforementioned sport fishers could benefit from various mobile interactions. These interactions depend on many factors such as the interactions between fishers, interactions between fishers and local authorities, and multilateral interactions. In the case of interactions between different fishers, one could differentiate other subcategories of fishing, such as fly-fishing or carp fishing. In the first case, the fishing is often characterized by frequently changing fishing places during one trip, while carp fishers normally remain at the same place. Fly-fishers might interact with each other in the same area to have a meal together. In contrast, carp fishers might use the time between two catches to broadcast their latest catches to their friends. Interactions between fishers and local authorities comprise, for instance, not only of the online acquisition of fishing permits (Carlsson 2008), but also the getting into contact with environmental agencies to report water pollution and increased fish mortality. Multilateral interactions such as sharing pictures, or recommending favourite fishing places and other more or less secret information, do often require more than only one party with which to interact. This is often done via community platforms where users administer their account, including privacy settings. One way of applying these settings is to define how much access other users may have to sensitive data, the quality of data they have access to, and other restrictions. One of these features applying privacy-preserving mechanisms is, therefore, allowing only persons with a high level of trustworthiness to have access to information on lately visited fishing places, with exact geographic coordinates and the corresponding catch statistics. Besides such confidential information, other information could be exchanged via such community platforms. Popular information for anglers concerns, for example, well-stocked tackling shops, where to acquire permits, and bait restrictions in certain water courses. Provision, collection, storage and sharing of fishing related information (e.g. personal statistics, information about environmental conditions like weather, water quality, etc.). Analysis of fishing statistics (e.g. regarding fishing quotas). Provision of legal information (non-fishing seasons, etc.). Delivery of services and products (e.g. physical services/products like lures). Finding of fishing hotspots (places with a high probability of catching fish). Provision of recommender systems for angling places. Utilisation of fishing-related services (e.g. monitoring of the development of fish populations). As outlined before, fishers may be organised in numerous different communities and the aforementioned sport fishers represent only one of them. Consequently, the members of such an angling, or fishing, community could be related in many different ways. In order to provide an adequate support for them and to properly design the respective mobile services, the relationships among the members and their context need to be depicted. 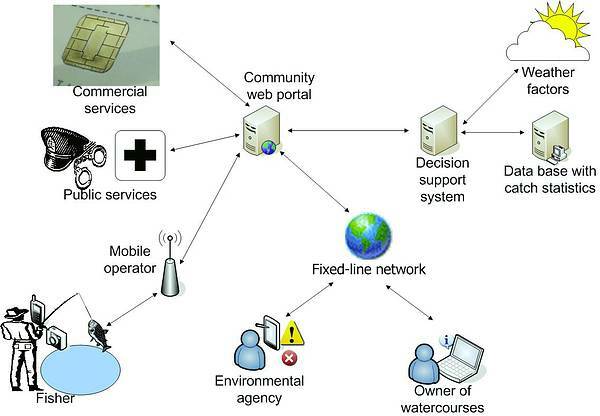 The following picture shows in detail the interconnections between the members of an angling community, the mobile community platform and their services, and further contextual elements, such as databases and public services. To gain a better understanding of the needs of an angling community and the resulting potential for mobile support services, the example of a single person, named John F., is now given, which is an excerpt from (Scherner, 2006). "John F. is an urban man, who is working for a company, which develops e-collaboration tools. He lives near the North Sea and normally he visits the same fishing place close to his residence at the coast. However, for his next holiday, he decided to book a special offer for a fishing holiday in the Alps to gather new experiences with fresh-water fish. After arriving at the booked hotel, he recognises that he has forgotten nearly everything about how to distinguish unerringly between fishes with similar outer appearance and about the preferences of bait and living space of certain fish groups. He had learned all this during his youth, but lost it over the years not fishing in foreign areas. During supper, he tries to get in contact with local anglers. Naturally, they protect their knowledge about their favourite fishing places and most popular baits and John has to leave without any inspirations for the coming days. A little bit worried and sceptical, he starts very early the next morning trying to find a nice fishing place around his hotel. Following a small valley with a mountain stream with his car, he tries to discover an attractive fishing place from the streets. Unfortunately, trees and rocks obstruct his view. After a while, he decides to take the next parking place, and go down to the water to find a pleasing place. Nevertheless, his actual problem that he has forgotten how to attract certain kind of fish with the right bait (and even worse not knowing which kind of fish he should expect in such a river) complicates the choice of equipment and fishing method. He decides to go for a pose and earthworms and to enjoy a sunny morning – unfortunately without having a single snap. During his lunch, he sees that fish quickly catch maggots that are falling from the trees. Therefore, he immediately changes over to the apparently better bait and gets rewarded with several snaps within a few minutes. After some failed attempts, he finally accomplishes to hook a pugnacious fish, wangles to get it into his brailer and starts carefully examining his catch. Consulting his fishing permit he tries to figure out which kind of fish this might be. Finally, he concludes that it may be one of a few possible fish species but he is not able to find out which on exactly it is. However, this is not a satisfying answer, because all these species have different open seasons and minimum length. Furthermore, one of the species, which the fish could belong to, is protected throughout the year. John is very unsure how to proceed. On one hand, taking a protected species with him will endanger him to get a fine of several thousand Euros, if the local authority controls him. On the other hand, releasing the fish might mean to go home empty-handed today. He tries to call a friend who is very experienced in such fishing affairs using his mobile phone but only reaches his mailbox. John ponders with the decision on how to proceed for a while and decides to release the fish to avoid potential trouble. On his way back to the hotel he remembers that some travelling anglers share their knowledge over different online fora. This would be very helpful, he thinks, regarding his experiences on this day, for gaining more information and sharing knowledge with others. However, he fears a bit the disclosure of private information and the loss of control over the circulation of such information. Ideally he concludes, there should be ways to include privacy mechanisms in community platforms and their services, to ease up anglers’ life” (Scherner, 2006). The outlined use case example already shows that there is the potential to support angling communities with mobile services. In addition to the identified users and their needs, however, the question arises of what added value the PICOS project could provide in this context. To answer this question, it should at first be emphasised that the traditional perception, that anglers are naturalists who neglect the use of modern communication techniques (e.g. Internet, mobile devices), is not true anymore. With increasing participation by the younger generation, recreational angling has adopted a high-tech attitude, involving fishing equipment as well as the use of the modern communication technology. The participation of anglers in numerous Internet portals dealing with their interests has proven that the majority of recreational anglers acknowledge the coupling of their activities to a technical environment. The convergence of telecommunications systems technologies and Internet technologies, especially in a mobile context, such as the one that PICOS is focusing on, will allow the delivery of information to the angler while being at the waterfront. In consequence, the use of mobile devices is in favour here. But within the angler community, there is not only the need for reliable and peer-reviewed knowledge about fish from an information system like FishBase (http://fishbase.org/) (Froese, 2008). Such communities also have a need for the more dynamic exchange of information between fishing individuals. Here, the spread and rapidly increasing power of mobile communication devices can be harnessed. At the same time, aspects of privacy and trust have to be ensured while personal and sensitive information is exchanged. PICOS could, in particular, provide answers to such questions and needs, which should serve as a basis and guidance for the design and development of appropriate mobile services. 1 The number of recreational fishers in Germany is estimated to be between 3.3 million and 5.8 million people, depending on the statistics. Arlinghaus, R., ‘Recreational fisheries in Germany: a social and economic analysis’, Report of the IGB, Department of Biology and Ecology of Fishes, Leibniz Institute of Freshwater, Berlin, Germany, 2004. Arlinghaus, R, Mehner, T, Cowx, IG, ‘Reconciling traditional inland fisheries management and sustainability in industrialized countries, with emphasis on Europe’, Fish and Fisheries 3 (4), 2002, 261-316. Carlsson Ch., Havnen A., Walden P., Making the Fun of Fishing Legal with Mobile Value Services, Proceedings of the Proceedings of the 41st Annual Hawaii International Conference on System Sciences, 2008, p. 86. Froese, R; Pauly, D, Fishbase version (02/2008), http://fishbase.org/search.php. Outdoorfoundation 2007: State-Level Economic Contributions of Active Outdoor Recreation – Technical Report on Methods and Findings. April 2007, http://www.outdoorfoundation.org/pdf/ResearchRecreationEconomyStateTechnicalReport.pdf. Scherner, T., Privacy as an enabler for new communities – an example of a leisure-time community, 3rd FIDIS Doctoral Consortium: Identity Management & Mobility in Practice, 2006, Stockholm, Sweden.